Ask any English football fan in their mid-30's or older for their thoughts on the 1986 World Cup in Mexico and chances are they will immediately blurt out something about "The Hand of God". It has been said that the World Cup has only been won singlehandedly twice, Garrincha for Brazil in 1962 and Diego Maradona in 1986. In Maradona's case the word singlehandedly takes on a more literal meaning though. 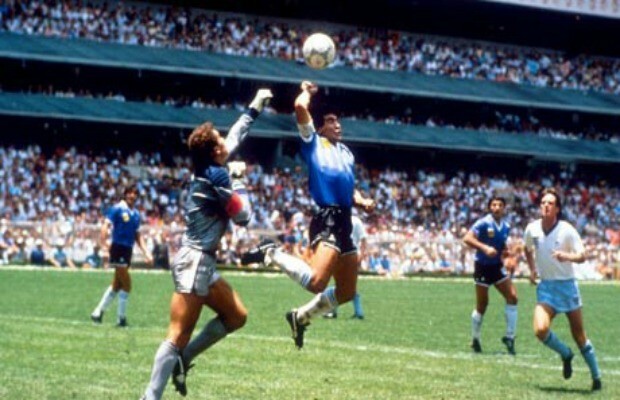 With his Argentina side being held scoreless by England in an evenly poised and politically charged Quarter-Final encounter in that scorching summer of 1986, a mis-hit back pass towards Peter Shilton was punched over the keepers outstretched hands and into the net by Maradona. As Argentina's number ten wheeled away in celebration, England's players surrounded the referee like they'd just collectively had their wallets stolen. The inexperienced referee from Tunisia, Ali Bennaceur, who FIFA really shouldn't have placed in charge of such a massive occasion, waved the English players away and allowed the goal to stand. Maradona would shortly after dribble through a dazed English midfield and back line to score one of the greatest goals in tournament history. Argentina would win the match 2-1 on their way to being crowned World Cup champions a week later. Although his second goal has been shown on highlight reels for the past three decades, and is rightly lauded for its brilliance, in England many still remember his first goal a bit more and view Maradona as a cheat who conned them out of the World Cup. Opinions won't be softened after this weekend either, as Diego found himself in Tunisia as he paid a visit to none other than Bennaceur. He presented the former referee a signed Argentina shirt and revealed that the two have stayed in touch since that match in 1986. 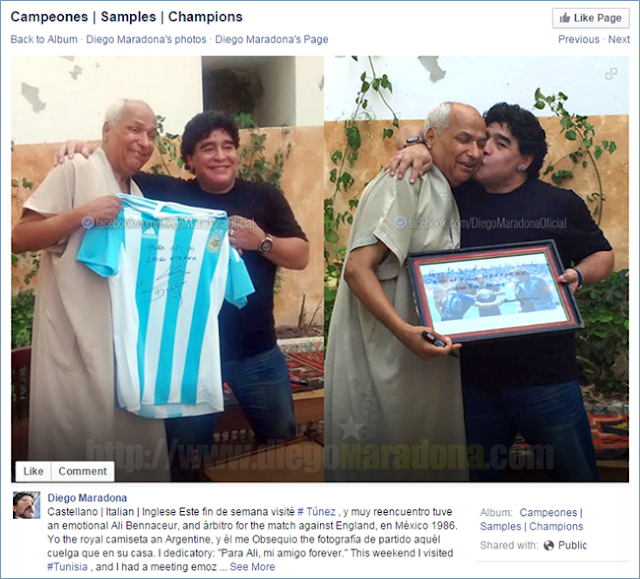 Maradona even referred to Bennaceur as his "eternal friend".